Born May 9, 1940, James Ifeanyichukwu Nwobodo, to the family of now late Susan and Peter Nwobodo, in Agyaragu, Lafia, Northern part of Nigeria, Nassarawa State. Jim undertook his primary school education at St. James School in Lafia from 1947 - 1950 and completed the secondary school education at Government School, Awka, Eastern Nigeria, now Anambra State, in 1956. In the same year, he entered St. Peter’s College, Zaria, and completed his studies in 1959, obtaining the Teachers Certificate, by which time the college, still bearing the same name, had moved to Kaduna. He later enrolled into the Nigerian College of Arts, Science and Technology, first at Enugu and then at Ibadan, to study for the advanced “A” Levels. 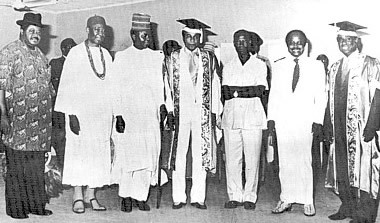 He then went into the University College Ibadan in September, 1961, from where he graduated in 1964 with a Bachelor of Arts (Honors) degree in English.As a student and for four years, Jim represented Nigeria as the only student member (and the only African executive member) of the World University Service (WUS) at the organization’s conventions. Also, Jim as an undergraduate was National Secretary of Nigerian Students Union. 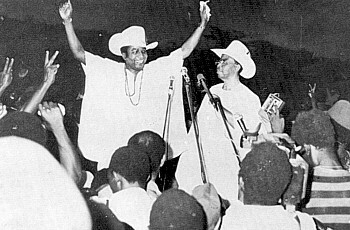 Soon after his University education, Jim was employed as a tutor in the King’s College, Lagos, one of the country’s top breeding grounds - known for its reputation for excellence, from 1964 -1966. In 1966, he took up an appointment with the Shell Company of Nigeria as Personnel Development Manager, Lagos. Later that year, he was seconded to Shell BP, Port-harcourt, still in the capacity of Personnel Development Manager, a post which he held throughout the Nigerian - Biafran war. His hobbies include playing and watching football (soccer); general reading; Listening to Classical Music and keeping abreast with current affairs. After the war in 1970, he founded a business organization. The flag-ship of his corporation, LINK GROUP INTERNATION LIMITED, of which Jim was the Chairman/Executive Director grew with branches in Lagos, Kano, Benin City, Aba, Calabar and Enugu, its home base. Link Pharmaceutical which represents UPJOHN WORLDWIDE, one of the five major drug manufacturing companies in the world and based in Kalamazoo, Michigan, is a subsidiary of Link Group International Limited. Supply of various laboratory equipment for re-equiping the University of Nigeria after the war. Supply of General Acience and Domestic equipment to 52 Federal Government Colleges in Nigeria. Supply of Science equipment for Physics, Chemistry and Biology to 45 secondary schools in (old) Anambra State. Supply of Drugs to (old) Anambra State Ministry of Health. He was also the Chairman/Executive Director of JIMSON INTERNATIONAL AL CARGO AGENCIES, with headquarters in Lagos. Jim is also Chairman / Publisher of Satellite Press Limited, publishers of Satellite Daily and Sunday Satellite. Jim was one-time Chairman of the divisional school board, Nkanu; Chairman of the Universal Insurance Company Limited, Enugu and Chairman of Premier Brokers Limited. As a Sports lover, he assumed the position of Chairman of Rangers International Club in 1975 and held that position until 1979. During his tenure, Rangers won the African Winners Cup. 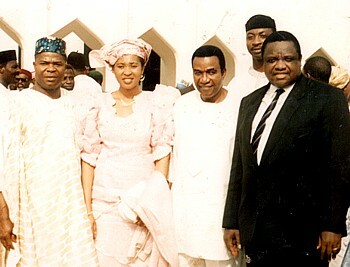 He was also a board member of the Anambra Sports Council. Consequently, He was a patron and member of a number of student organizations, including the ground Ivy League, the Zeta Zee Club, Kandel Club, BD Hall Enugu campus of the University of Nigeria, International Association of Students of Economics and business (AIESEC) and the international Students' Association. Also as a philanthropist; Jim has donated generously for the construction of a Church building, the University of Nigeria Endowment Fund, and to the South African Relief Fund. His company also donated to this fund and the staff of his company also paid 2% of their salaries, each, to this fund. He renovated the St.Matthew's Anglican Church, Amechi Awkunanaw. 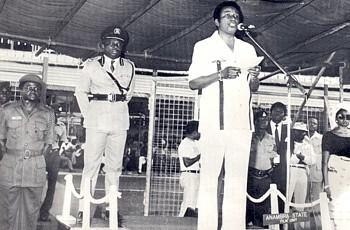 Jim ventured into politics at a very young age of 39 years and as a member of the now banned Nigerian peoples party (NPP) under the leadership of the Rt. (Hon) Dr. Nnamdi Azikiwe, the late owelle of Onitsha. In October 1978 he was elected to the post of NPP protem Chairman for the then Anambra State. 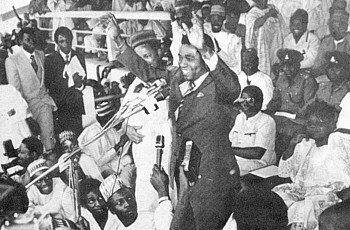 He later became the State Gubernatorial candidate of the party, and was endorsed by the great Zik. He won by a landslide and on 1st October, 1979 he was sworn into office as the first executive Governor of the old Anambra State. as the first Executive Governor of the then Anambra State. i. The Greater Enugu Water Project. ii The Ikenga Hotels at A wka and Nsukka. v The Aluminum Ports Factory at Ogbede in Igbo-Etiti Local Government Area. vi The Building Materials Factory at Ezillo in Ishielu Local Government Area. .
vii The Nike Lake Resort. 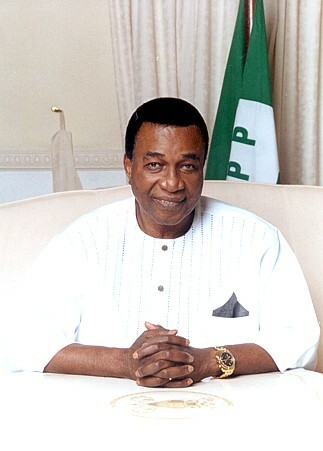 Chief Nwobodo' s administration also built the Anambra State Television Channel 50, and initiated the construction of the Nnamdi Azikiwe Stadium. His administration also embarked on several road reconstruction project. 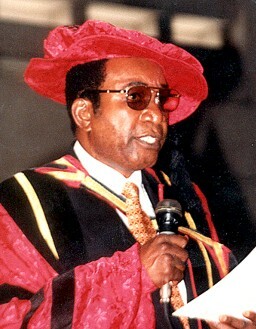 Jim Nwobodo made agriculture another area of priority. His government introduced the establishment of Agro-service centers and community farms as well as pest control measures in the States: He launched the Food for the People Program. He also established a Ministry of Food Production. He contributed to the Health sector by building Health Centers across the State. He revived the Rangers International Football Club of a Enugu and led them to win many local, national and continental competitions, the biggest of which was African Cup Winners Cup. His administration launched the Anambra State Road Safety Corps in 1982. In the area of education, perhaps the greatest achievement was when his administration established the first Nigerian University of Technology- the then Anambra State University of Science and Technology (ASUTECH). The university was modeled after the Massachusetts Institute of Technology, and was placed under the care of the late Professor Emeritus of Harvard University, Kenneth Onwuka Dike. the ASUTECH also relied heavily on the scientific knowledge of Dr Heskia Heskiof of the New York Institute of Technology. It is to be noted that the ASUTECH was founded along the lines of a multi-campus system so as to broden the base of its impact on, and to stimulate the native industry and technology. It began with three capuses and later the three campuses of ASUTECH provided the infrastructural framework for the springing up of three seperate Universities, namely; Nnamdi Azikiwe University Awka, Anambra State. Enugu State University of Science and Technology Enugu, and Ebonyi State University, Abakaliki. 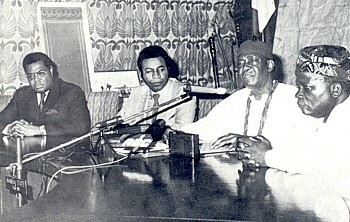 *After the collapse of the second republic which interested the incaceration of many political leaders of the time including Jim and the still born third republic, the Abacha administration came into power with the establishment of the Constitutional Conference commissioned to midwife a constitutiol that would give the political direction and the future of Nigeria. Chief Nwobodo was appointed a member of that Commission and also served as the Chairman of the publicity committee of the Commission. While still a member of the Constitutional Conference commission, he was appointed a Minister of the Federal Republic of Nigeria in 1995 and was given charge of the Federal Ministry of Youth and Sports. During his tenure Nigeria's Olympic team won two gold medals, the high point being the Gold medal in football by the Nigeria (Dream Team). He was subsquently a member of the Social Democratic Party (SDP), the United Nigeria Congress Party (UNCP) and later Grassroots Democratic Movement (GDM). He is a founding member of the Peoples Democratic Party (PDP). In 1998 he was one of the seven presidential aspirants, including President Obasanjo that sought the PDP'S ticket to Fly its Flag at the general elections 1999. Jim, the presidential flagbearer for UNPP, Elections '2003. Jim is happily married with children. Jim has a moral commitment which has been pivotal to the smattering land-marks which he has registered in the action-packed trail of his life - a long way from his humble but decent up bringing to a career as an educationist, as a progressive businessman, as a (former) Governor of (old) Anambra State, as Honourable Minister of the Federal Republic of Nigeria, as a Presidential aspirant in the PDP Jos Convention 1998 and as Presidential Flagbearer under the UNPP in the general elections 2003. Is a celebrated sportsman, and has been conferred with honors, awards and titles among which is the Anyanwu N' awaroha 1st of Nkanu.